It hardly hit any solid ground and only in pretty remote spots of the planet - and yet thanks to the WWW and its old and new communications tools you could almost "be there" during the 26 January solar eclipse while frantically switching between various general 'social media' and highly specialized eclipse-related "feeds". In the early hours several true webcasts (with almost video rate) and open image collection sites, esp. Flickr and Twitpic, plus a special chatroom won hands down regarding speed, though the majority of the early images - access the individual screenshots via the "ase" tag - was poor (with a few really good ones scattered among them); the same was true for the early YouTube entries. With the hours passing after the antumbra had left the Earth, key "firsts" came every hour or so: the first clear image of a deep partial phase through clouds, stunning views of the partially eclipsed Sun setting in Manila Bay, then the first closed ring with hardly any clouds interfering. While most of Indonesia in the path of annularity was cloudy as expected, in several places it had been almost clear - while on the Cocos Islands it was raining like hell at the crucial time, smashing the hopes of the 11 eclipse chasers who had made it there. 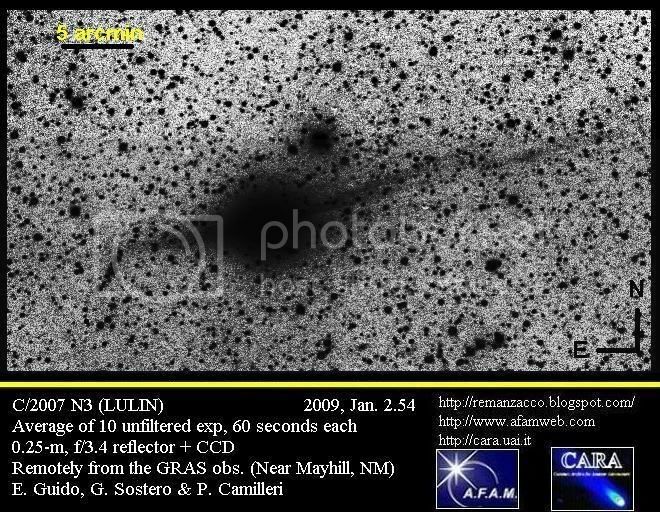 As I write this, some 36 hours after it was over, high quality material has started to roll in through the "traditional" amateur astronomical channels, but I haven't seen an image of annularity with clearly visible Baily's Beads so far, let alome the chromosphere inbetween them - thus the Grand Prize of Annularity (easily served in 2005, for example) isn't in yet and may have been missed by the lucky few in the clear zones of Indonesia. But there are outstanding images aplenty - for example somewhat fuzzy TV material of the ring closing, seen here (with Spanish commentary), here (German; from second 56) and here (silent). The best still photos of the ring phase are probably these by an amateur (two more in the stream) from Bontang on Kalimantan and these from Reuters on Sumatra. But regarding "stunningness" they have hard competition from these gorgeous pictures (many in the stream!) from Manila - hardly ever has an eclipsed Sun been captured that clearly on the very horizon. 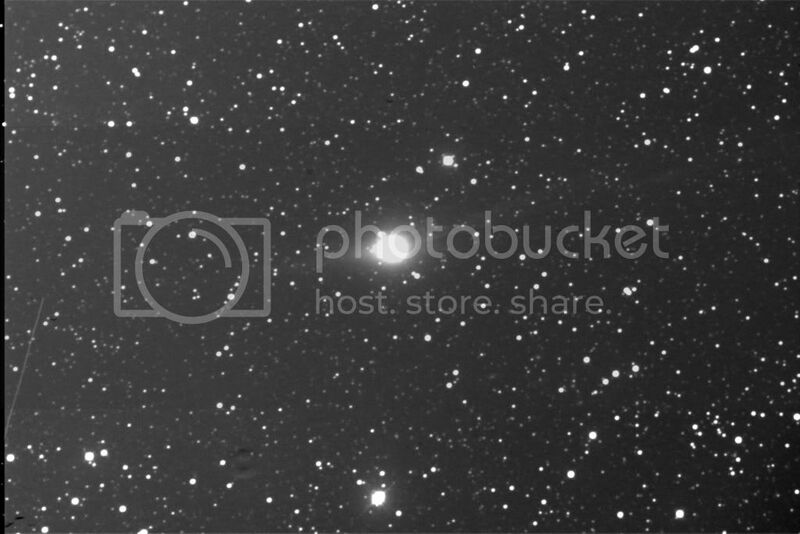 The most convincing picture collections to date are probably those from SpaceWeather (starting with a fine animation of the ring closing), Flickr (an extremely huge set) and a South African IYA project (connected to this Flickr tag). Special reports from the annularity zone have been received only from Indonesia's Anyer so far: Jay Pasachoff shows his results (heavy clouds but ring seen) and all pictures from the trip while Xavier Jubier has a small sampling. 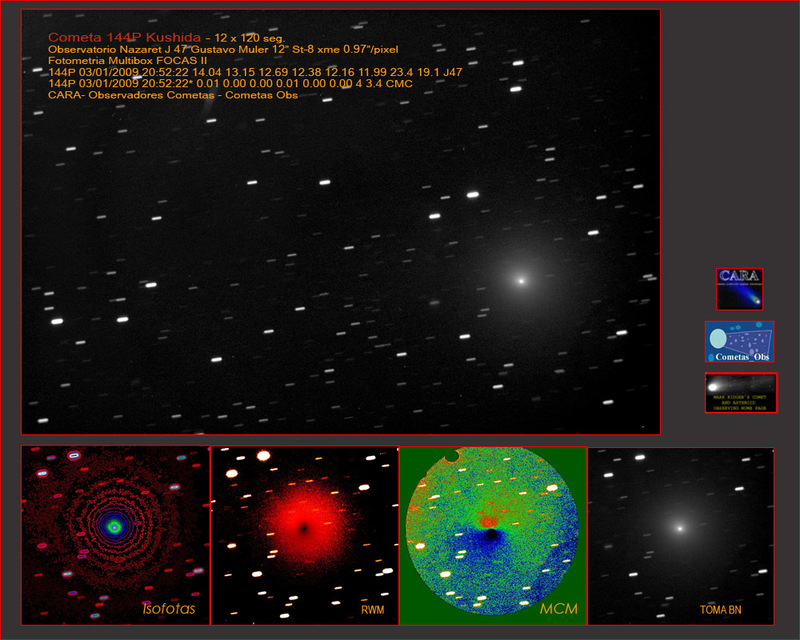 One of the webcast projects in Indonesia also has something to show - and report. From the partial zone reports have been found from Zamboanga City in the S. Philippines (pretty 'artsy' pics), Chennai (with more pictures) and Bangalore in India, Malaysia and Australia (another one). Amateur video clips of note come from Indonesia (another and another one), the Philippines and Malaysia. Selected pictures are worth highlighting from Jakarta (another stream and another pic probably from there) and Manila (probably); Manila shots also appear in the news media here (als #35) and here, while a view from Thailand was used here. And eclipse articles were found here, here, here, here, here, here, here (w/slide show), here, here, here, here and here. And while I'm frantically collecting further results, S. Krause is doing the same here. Annular eclipse less than 24 hours away: How much of it will be online? The first of 2009's two full-silhouette eclipses is almost upon us: On Monday the shadow of the Moon will sweep across the Indian ocean, and while the antumbra makes little landfall, several countries will experience partial phases. Some eclipse chasers have actually made it into areas of annularity, though, and this being the 21st century they will attempt to webcast the ring of fire or at least e-mail pictures to certain websites shortly after the event. One expedition from India has made it to Indonesia and reports good weather: They are twittering their trip, but their webcast can only be seen by subscribers - or at the planetarium in New Delhi. Free webcasts from Indonesia could appear here and here, however, as several more foreign eclipse chasers are in the country, too (Jay Pasachoff has just sent these pictures from Jakarta). And a few others made it to the Cocos (Keeling) Islands in the Indian Ocean, reporting good and bad weather at eclipse time: Their reports and pictures appear here or on the front page of AstroNation, while in South Africa (which will experience a partial eclipse) pictures from all over the world will be collected here. Some articles on this eclipse appeared also in Australia (which won't see much on its mainland), on AFP and in Space.com - where mysteriously one of my 1992 pictures makes an appearance. The New Moon of 26 January also means the New Year for the traditional Chinese calendar. And talking about the Sun: In 2011 the STEREO s/c will - for the first time in history - see everything when they are 180° apart. In other news here are Venus & Uranus on 22 January when they were closest together. • There is now an effort to observe occultations by TNOs with vigor, while this paper lists Saturn satellite mutual event successes of a previous season. • On Saturn itself a white spot was discovered and confirmed; also an 18 January picture and the 2009 viewing conditions. Plus - from 2007 but re-published - Jupiter & its moons in action. 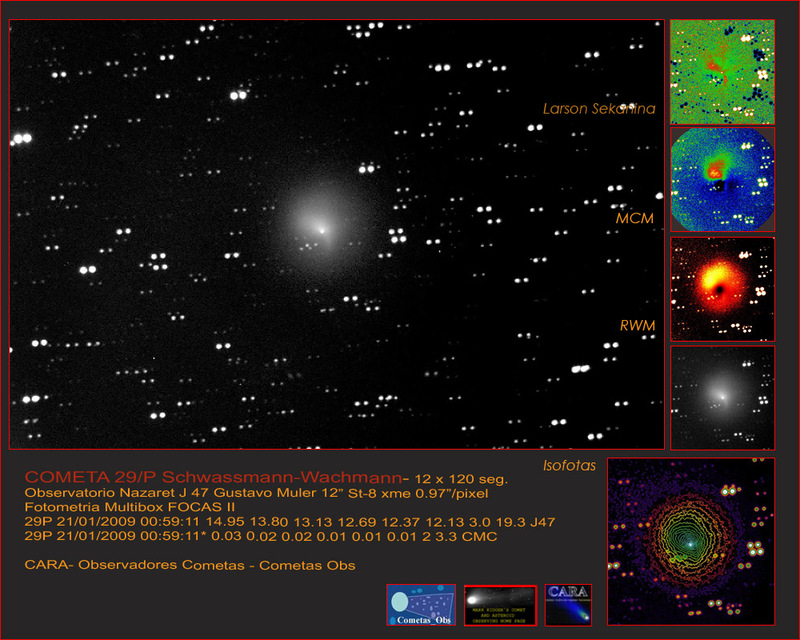 • Here are nine comets on 23 Jan., the jet in the coma of 29P has intensified (also pics of 21, 20 and 16 Jan.), for Lulin (praise for this page) we have a new analysis and observations of 24, 23 and 21 January, for 17P/Holmes a rare scientific paper about its 2007 outburst and recent pictures of 144P and C/2006 W3. 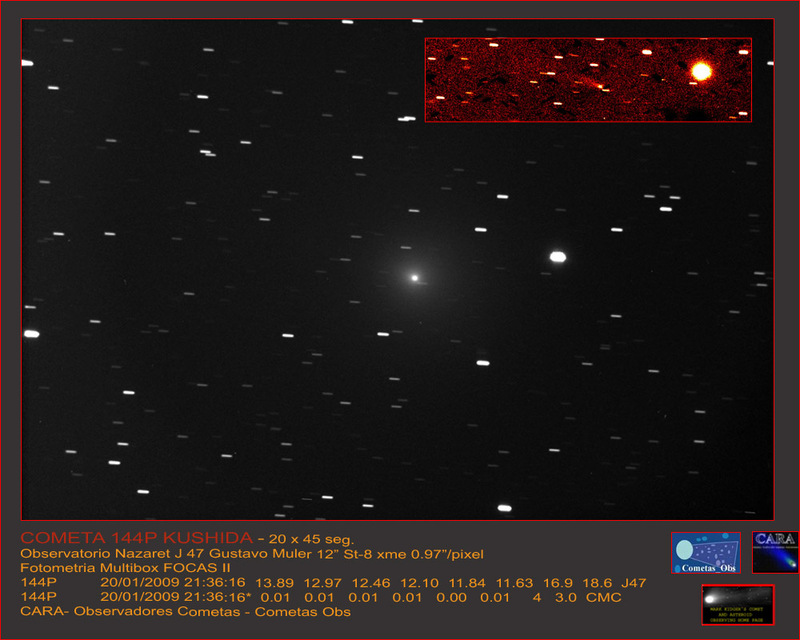 • Unfortunately there are no good European Network images of the 17 January fireball over Europe (which continues to spawn reports here, here, here, here or here) - so the trajectory of the cosmic body isn't well known. There were other major fireballs in California on 18 January and in Massachussets on 23 January, by the way. • It seems to become a trend to wildly enhance the colors of the full moon as this full-disk and this close-up (of Copernicus) examples show - you can learn something about the Moon's minerals this way. And displaying the full moon in negative also offers new "insights". • There is a major competition going on in the U.K. - but everyone can participate: Astronomy Photographer of the Year 2009. • And finally here's a list of signs you are an astronomer (of the amateur kind, that is). A major fireball on 17 January at 19:08 UTC was seen widely over Northern Central Europe, with reports from Sweden, the Netherland, Germany and Poland so far - and as with the Canadian fireball last year, there is at least one detailled video available (alt. source and stills) as are all-sky images (alt. source). Here are early blog reports from the U.S. and Germany (more, earlier, more); notes in observers' forums in Germany are here and here and media stories here and here. • The Earth flyby of the NExT spacecraft has been observed by some. 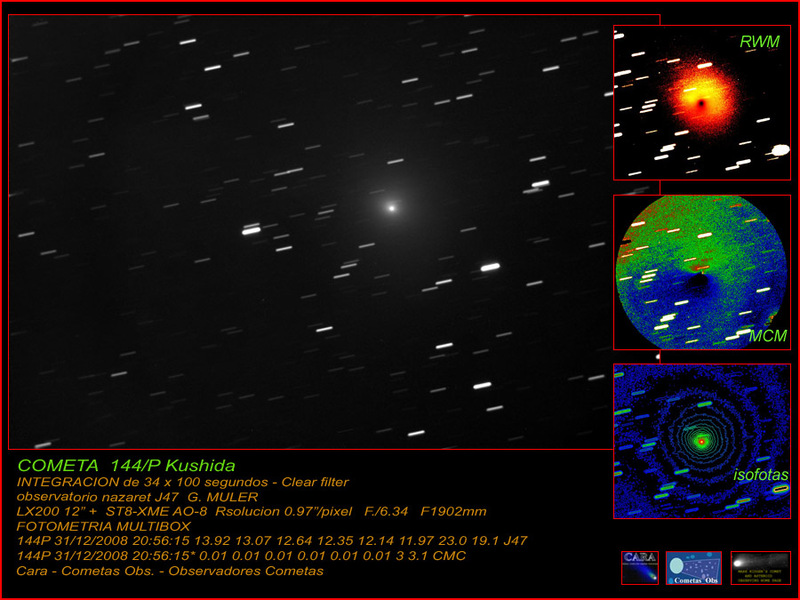 Comets in the News include 29P/Schwassmann-Wachmann which now shows peculiar features in its coma (another report & picture and a Jan. 9 view), 144P/Kushida seen here Jan. 16 and Jan. 14 (also a widefield view with finder chart), C/2006 OF2 on Jan. 14, 67P on Jan. 16 and C/2007 N3 (Lulin) for which we have a growing gallery, info pages and stories here, here, here and here and sparse new observations of Jan. 17 (picture), Jan. 15 and Jan. 12 - but with the Moon about the leave the morning sky, the first good viewing window is opening soon! • Behind all his comets: Meet Boattini - the man! • Some constellations: Venus & Uranus on Jan. 17, Venus & the Moon in an Indian panorama on Dec. 31 and the very young Moon - after a dramatic sunset - on Dec. 29 (so under perfect conditions it could be found even from Germany that day already). • Preparations for the annular eclipse on Jan.26 are underway in Indonesia and South Africa where it will be partial but pictures from around the Indian Ocean will be aggregated. Also a very late report from the last total solar eclipse, the Sun on Jan. 9 and more pictures of the large full moon here, here and here, plus the view on Jan. 12 and with the ISS in front of it! While the International Year of Astronomy, now 11 days old, isn't rich in unusual sky phenomena, it had a good start - and one sky phenomenon, often dreaded for drowning out most others with its glare, turned out to be enormously popular: the record-close full moon of January 10 or 11 (depending on your time zone). 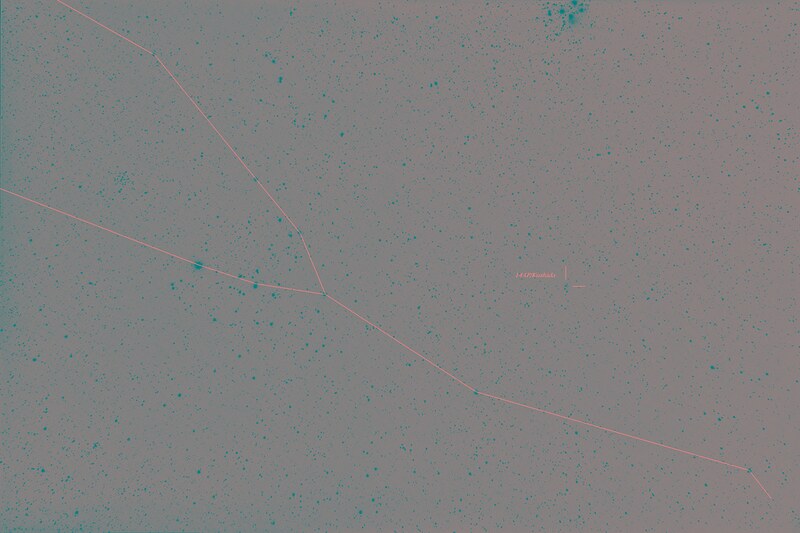 If one takes the flow of messages on Twitter containing "moon" as a measure of general interest in a topic, the sky show inspired people in all walks of life: Several tweets per second came in at time during the night and several per minute even on the day after - expressing great fascination, pointing to news stories and good (and bad) pictures taken. 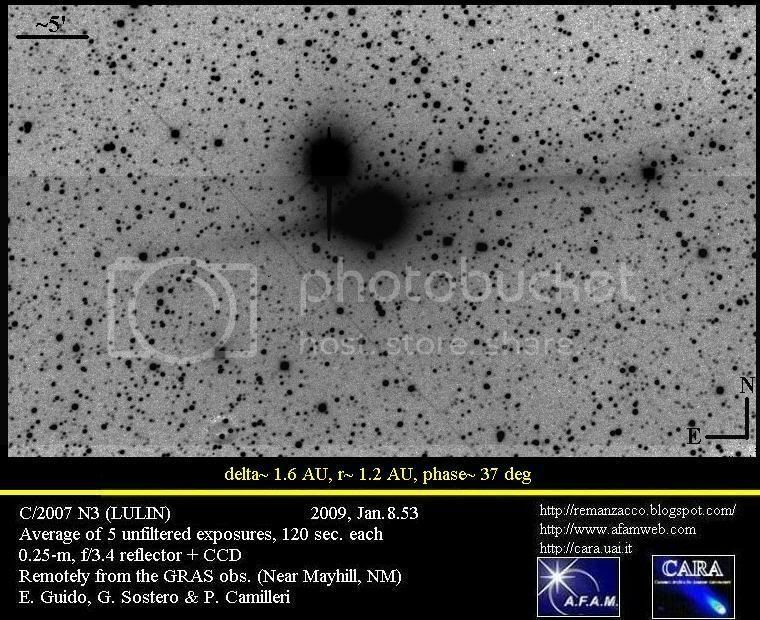 Here then are the big celestial newsmakers of early 2009. The had been ample announcements that the 2nd full moon in a row would be the closest of the year (2008 and 2009, resp. ), and tons of photographs were taken: You can see some here (hi-res!) and here and here and here and here and here and here and here and here and here and here and here and here, see growing collections here or here (this blogger's collecting effort being appreciated!) or moonlit Pelican Lake at midnight or attempts to bring out the subtle colors of the lunar surface (this effort has been met with enthusiasm already). • Another Pleiades occultation by the Moon 3 days earlier was hard to photograph, but some good results are here, here, here and here. Earlier this month, Jupiter slipped by Mercury and is about to disappear in the solar glow soon, to be followed by Mercury - but Venus (with Uranus nearby) will stay on: pictures and stories from January 10 (Austria and Germany), 8 (Austria; also Venus in a moonlit snowscape), 5 (USA, Germany), 3 (Germany, also with Venus), 2 (Austria and Germany) and 1 (Switzerland) as well as December 31 (USA, again at night and in daytime, Austria, Germany, India and many more) and 30 (Germany and India). From India also a newspaper story mentioning the Dec. 31 constellation. • We have also nice close-up pictures of Saturn - still in the morning skies - of Jan. 11 and Jan. 6 (more), observations of another mutual event of two satellites and a Titan egress as well as of Venus on Jan. 10 in false colors and with lots of cloud detail. 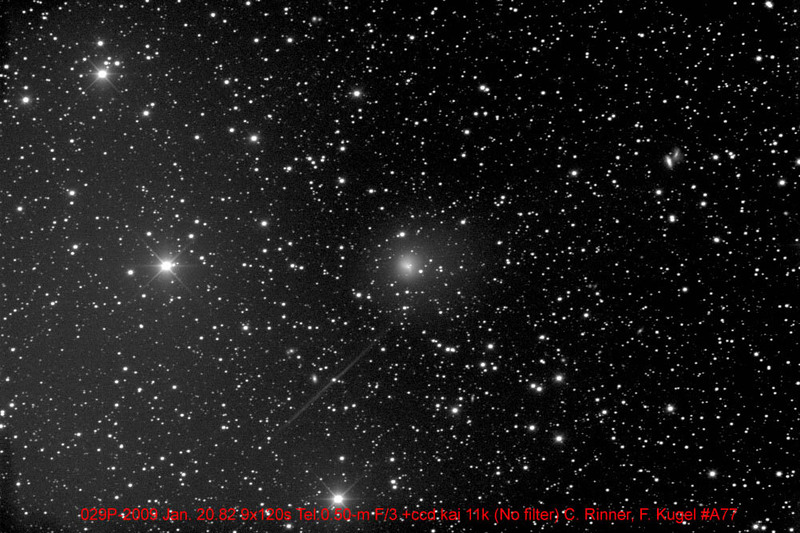 Comet C/2007 N3 (Lulin) is now emerging from the Sun in the morning skies at about 7th magnitude and should reach 5th or 4th in the 2nd half of February, coinciding with perfect viewing geometry and moon-free skies in the Northern hemisphere. 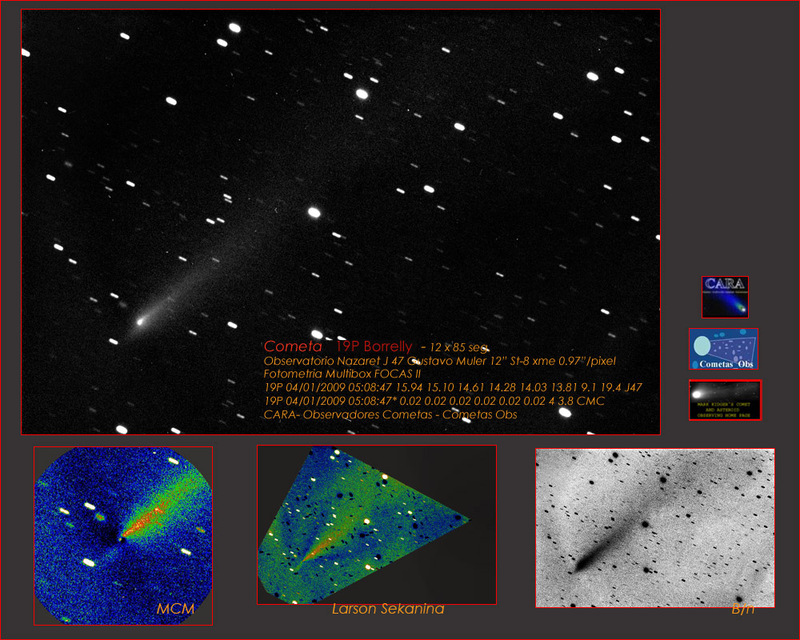 General information - and many links - can be found here, here (visibility analysis for 50°N), here and here; the fact that we are in the comet's orbit plane will be important, and there could also be a kind of opposition effect. Here are some particularly good pictures - often with a structured plasma tail in the anti-sunward direction and a dust antitail - from Jan. 8 (more and more), Jan. 7, Jan. 5, Jan. 2/3 (the latter two taken at Lulin Obs. by one of the comet's discoverers), Jan. 3 and Jan. 2 (more and with enhanced contrast) and visual reports of Jan. 9, Jan. 5 and Jan. 2 as well as a picture collection, another one, a wide view and newspaper stories from India and Taiwan. 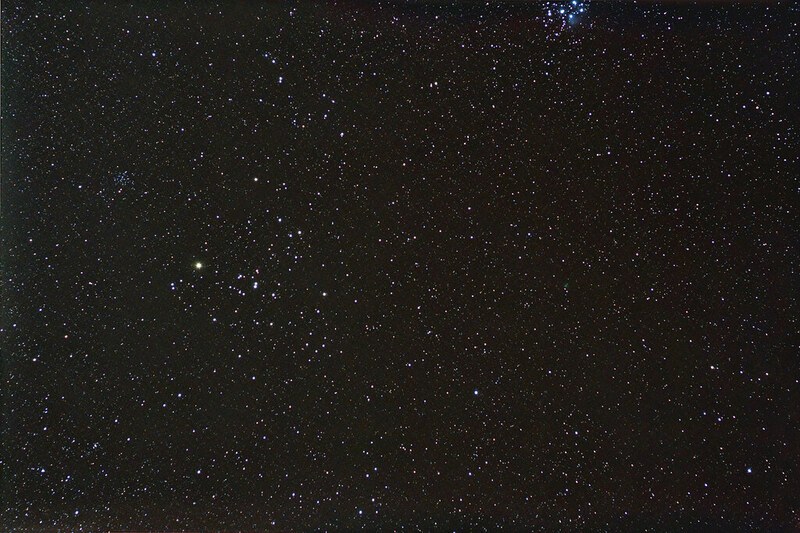 • Some upcoming comet conjunctions with deep sky objects, 144P on Jan. 3 (more) and Dec. 31, C/2006 OF2, 29P, 19P, C/2006 W3 and Christensen (also its dis-/recovery story). As the visual observing data show, the Quadrantids had a nice, sharp peak - right on time, also! - with a maximum zenithal hourly rate of approx. 150: That's about as good as it gets! There were plenty of videos (more) and pictures (more) taken, and we have exciting observing reports from arctic Canada, Germany and Arizona. • There is now a 2nd "2nd opinion" on the Leonids of 2009, again not confirming a half-storm with 500/hr. • Yet more photographs of the fresh Canadian meteorites. • The first(?) amateur picture of asteroid (3559) Violaumayer; the official citation should make clear why it's close to the heart of German amateurs. 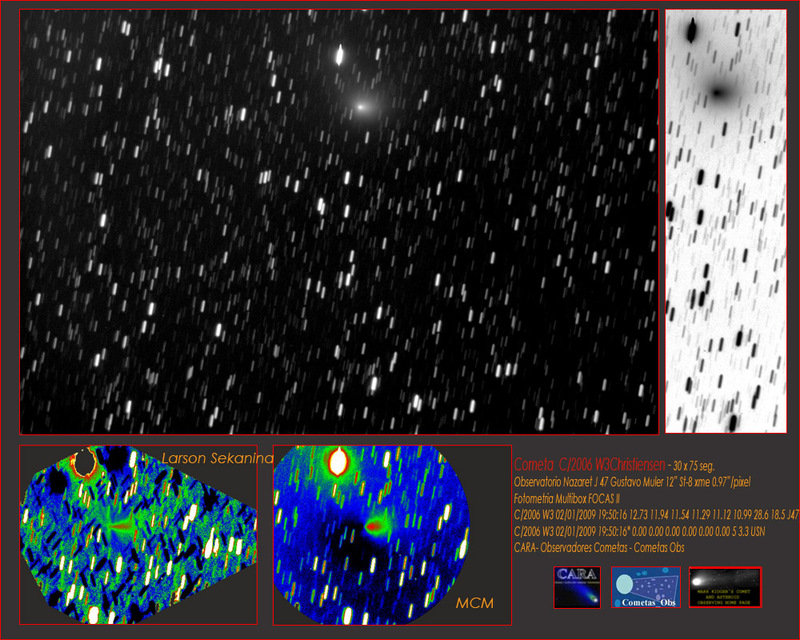 Meanwhile the Catalina Sky Survey has received further funding until 2012. • Well equipped amateurs can now try to catch the NExt spacecraft that approaches Earth on Jan. 14. British amateur already found two supernovae this year! 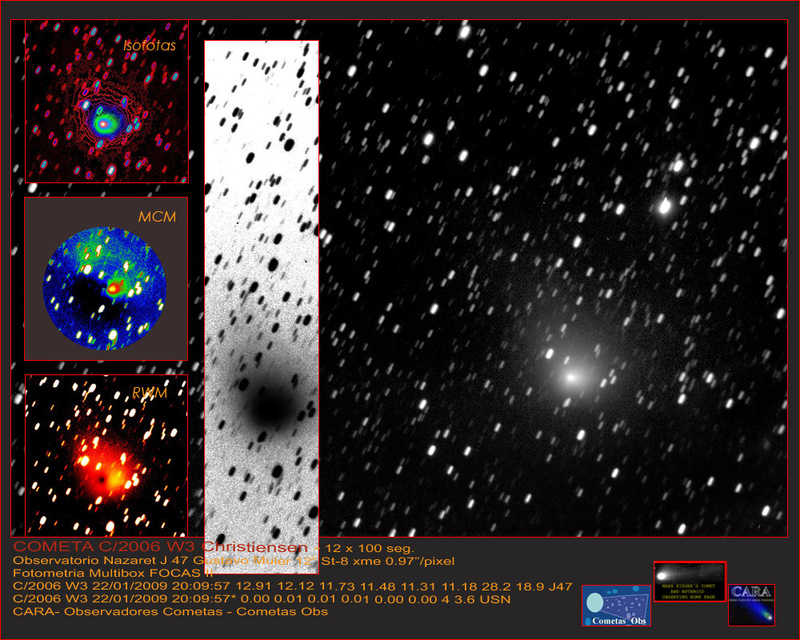 He is Tom Boles, and in the first week of the new year he caught his supernovae #118 and #119! Even more impressive is the fact that he started not that long ago, works from England - and works alone. 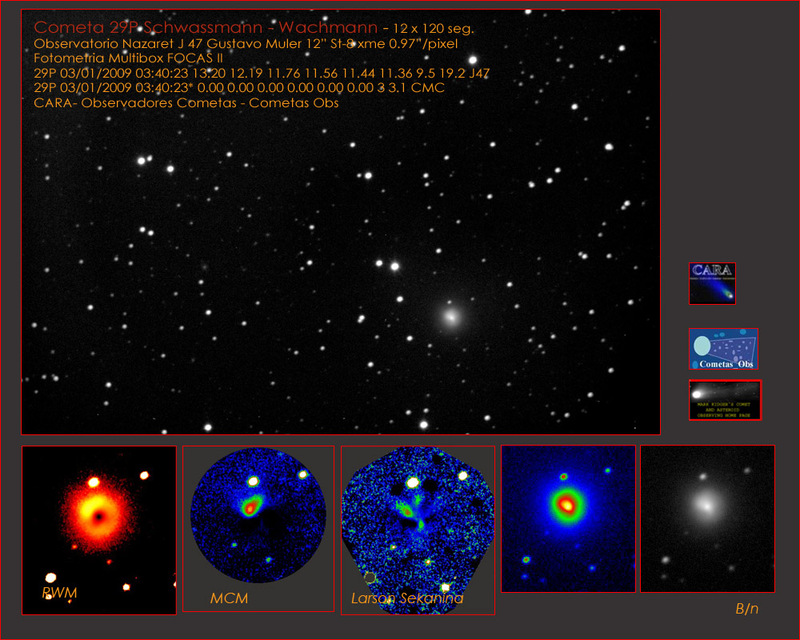 Meanwhile a nice supernova appeared in Messier 61 (one more image). • From China comes a nice view of the lunar umbra on Asian soil during the 1 Aug. 2008 TSE. • And on the Sun itself there is now AR 1010 which is not big, but you take what you get when there is so little there - and what will come is notoriously hard to predict ... • From the "just pretty pictures" department, may I recommend SkyPhotographers and pictures from India (more). • An interesting sidenote on light pollution issues: the dangers of polarized light for wildlife (also covered here and here). More outlooks to the 2009 skies for January, the whole year (more) and from ESA's viewpoint. • Meanwhile here is an actual picture of the recent leap second. • And finally this blogger has seen more "best of 2008" lists of space and related things in the last weeks than ever before; there are even lists of lists here and here and tops of the tops. Some lists now by Discovery, ITV, TPS, New Scientist (more, more and more), Space.com (more), AN, S&T, BAB, Nat'l Geographic, TIME, Universe Today, SciAm, Cosmic Log (more) as well as from the Univ. of AZ, NASA and DLR. And the BBC has 100 things we didn't know 12 months earlier.